Educational Qualification : Candidates should have passed 10th class with 3-year regular Diploma in Mechanical/Automobile/Fire OR 10+2 with minimum 50% marks from a recognised university. (as on 31-12-2017) Minimum 18 years and Maximum 30 years. Selection of candidates will be made on the basis of Computer-based Written Examination, Documents Verification and Physical Endurance Test. General/UR/OBC candidates have to pay Rs. 1000 through online mode using Net-banking/Credit or Debit Card. SC/ST/Ex-Servicemen/Women candidates don’t have to pay any fee. 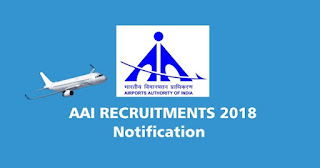 Interested and eligible candidates may apply online through AAI website - https://www.aai.aero/ - from 06-12-2017 to 31-12-2017.